France's petrol distributors have urged the government to release emergency fuel stocks following strikes that have blocked most French oil refineries. The firms warn that only 10 days' fuel is left. They also want protesters blocking fuel depots to be removed. Earlier, French officials said there would be no shortages for at least a month, and warned against panic buying. Unions are organising protests and strikes against government plans to raise the retirement age. 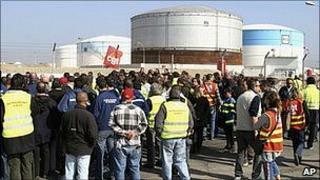 Eight of France's 12 mainland refineries are reported to be shutting down operations because of the blockades. The distributors warned that unless action was taken there would be petrol shortages across the country. Jean-Louis Schilansky, President of the French Oil Industry Association (UFIP), said that on average they had about 10 days of supplies left in depots. "We ask permission to dip into the reserve stocks available to distributors, to support customers beyond these 10 days," he said. He also called on the government to "unblock the depots which protesters are preventing from working". Standing off Marseille there are now more than 70 ships carrying crude oil for refining, stranded at sea. Strikes at the refineries, which began as a dispute over port reform, have now spread to eight out of 12 plants around the country. Elsewhere there are rolling strikes in the energy and transport sectors, though nowhere near as effective as the strikes at the refineries. Buses and metro trains are still running. But there are worrying signs the mood of the demonstrations is turning ugly with more and more students now joining the movement. There is a national demonstration planned for Saturday and another round of strikes on 19 October. The government says it can't and won't back down - but then neither will the unions, and according to polls they have more than 70% of the public's support. France's strategic reserve consists of 17 million tonnes of refined fuel products and crude oil - the equivalent of 98.5 days of normal consumption. The BBC's Christian Fraser in Paris says the government will probably turn first to smaller reserve stocks - 11 days of fuel - but that is provided they can get it out. There are now blockades at five distribution depots in the south. Government officials have tried to play down fears of petrol shortages, insisting that France has enough to see out the industrial action. However, panic buying has broken out in some areas, putting supplies under greater strain. Speaking earlier, Transport Secretary Dominique Bussereau said there should be no shortages at petrol stations for at least a month. But he warned against further panic buying. "There has been a 50% rise in petrol consumption this week simply as a result of panic buying. So if there's no more panic buying, we'll have everything we need to hold out," he told La Chaine Info television (LCI). Protests erupted after President Nicolas Sarkozy announced plans to raise the minimum retirement age from 60 to 62, and from 65 to 67 for a full state pension. More than a million people took to the streets in the latest national protest on Tuesday. France's main unions have since stepped up their action, calling for the fifth in a series of strikes and street protests on 19 October.